This pattern is available from hollaknits.com for $6.00. Henri is the lovechild of a free spirit French girl and an English longshoreman. This oversized sweater is constructed horizontally, and is made up of blocks of texture and cables. It is meant to be thrown on with ease, over a long skirt or worn-in jeans. Henri will keep you warm and cozy for all your winter adventures. Finished Size 30 (34, 38, 42, 46)” bust/chest circumference. 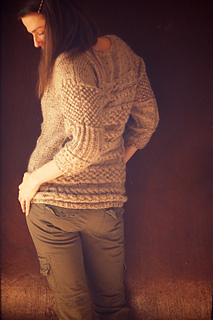 Sweater shown in 34” in Knit Picks Swish DK, and 38″ in Springtree Road. Yarn Knit Picks Swish DK, 100% Superwash Merino Wool; 123yds/50g: Bark, 11 (11, 12, 12, 13) skeins. Yarn Springtree Road Praline DK, 80% Superwash Merino, 10% Cashmere, 10% Nylon; 230yds/100g: Idyl, 8 (8, 9, 9, 10) skeins. Needles Size 4 (3.5 mm): 24” circular (cir) and double-pointed (dpn); Size 5 (3.75 mm): straight. Adjust needle sizes if necessary to obtain the correct gauge. Notions Markers (m); tapestry needle; cable needle. Gauge 25 sts and 30 rows = 4” (10 cm) in Texture Stitch on Size 5 (3.75 mm) needles. Texture Stitch is a 2 sts repeat, CO 26 to check your gauge, knowing that your gauge swatch will be 1 st larger than 4” wide.